We are all familiar with the convenience of the retail giant that is Argos; as it’s the go-to place to pick up all life’s essentials. But Little did Joanne think that her part-time job in the famous catalogue store would lead to meeting the love of her life! Thanks to a colleague, Joanne was given Roberts Details and she pressed ‘Add to Cart’ (thankfully Robert was in stock!) and their Love Story began! Robert surprised Joanne with a beautifully romantic proposal while the couple where on a break in Poland to celebrate Roberts Birthday. Joanne had given Robert a scrapbook full of memories of their relationship before she had to go to England for work. Sitting in a beautiful Court Garden in Krakow, Robert returned the scrapbook to Joanne filled with all the reasons he loved her! While she was tearfully reading the book, Robert got down on one knee and of course she said YES! The date was set and the plans were made for the two to marry in St. Therese’s of Lisieux, Belfast on July 20th 2017. Joanne and Robert set about planning their big day and wanted the focus to be on sharing their love with family and friends and having everyone enjoy the celebrations as much as them! One of the most important parts of the planning process for any bride is choosing her dress! Joanne knew when she met the girls at Serendipity Bridal Boutique that she was in good hands. With their help and guidance, she chose a stunning Pronovias gown with an off the shoulder neckline, dropped waist and a line skirt. As soon as Joanne looked in the mirror she ‘felt like a bride’ and she knew this was ‘The One’. On the morning of the Wedding Joanne and her girls where relaxed and enjoying the craic when the very talented Jolene McCarten aka Lady Unicorn arrived to do hair & makeup. Joanne even declared at one stage ‘I don’t know what all the fuss is about’! This was one cool bride who just wanted to relax and enjoy her day and put her trust totally in the suppliers to do their job – a model bride!! Joanne’s beautiful bridal gown was complimented by her stunning bridesmaids who chose dresses from the Adrianna Papel Collection in a deep purple soft chiffon fabric. Joanne then tied everything else into the theme with Amazing flowers from Petals and Pots in Downpatrick – who Joanne highly recommends to any bride! Not to be outdone by the ladies Robert and his boys were given a little upgrade and polish from the team at Focus Menswear in Bangor. Wearing matching blue suits with their navy brogues, Robert stood out with a contrasting grey waistcoat. He’ll tell you he chose everything himself but we all know who really made the decision! 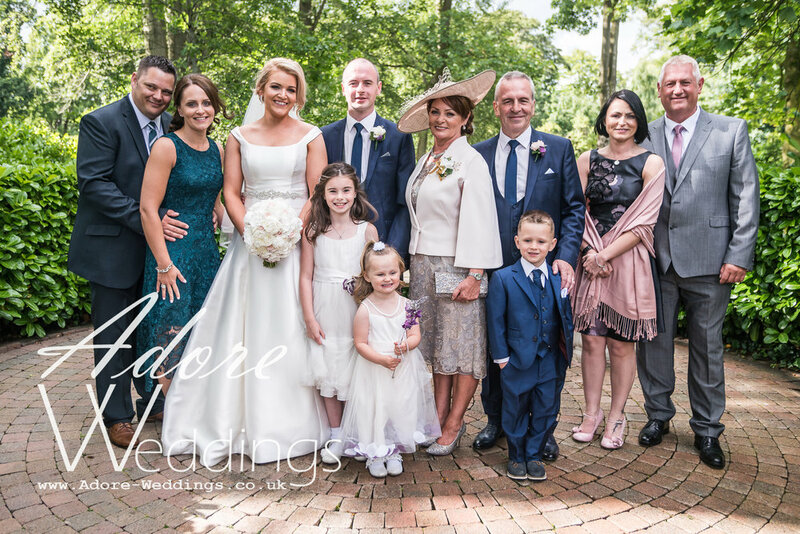 Following a beautiful ceremony, the couple were lucky enough that the sun was shining and Adore Weddings did their magic to create these stunning photographs to capture all the special moments. Guest where treated to an evening of food, toasts, emotional speeches and lots of dancing in the gorgeous Clandeboye Lodge Hotel, Bangor where they partied into the small hours and celebrated the couple in style!